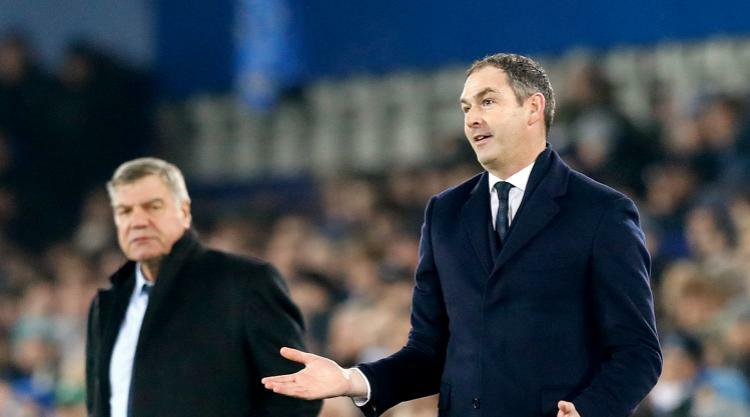 Swansea manager Paul Clement is targeting a much-needed win over Crystal Palace at the weekend to kickstart their survival battle. A 3-1 defeat at Everton left his side rooted to the bottom of the Premier League with just 12 points from 18 matches - exactly the same record which saw Bob Bradley sacked to pave the way for the former Real Madrid and Bayern Munich assistant manager to come in. He successfully guided them to the safety of 15th place and believes the current state of affairs is not yet as bad as the one he inherited. "We have an opportunity to get to 15 at the halfway point, which would be a better situation. That is what I have to focus on," he said. However, his task has been made difficult by injury to striker Wilfried Bony - up until last night the only player to have scored since the end of October. The Ivory Coast international came off less than four minutes into the game to leave his manager frustrated. "I don't even know what action he had done to create that injury. He has injured his hamstring, the physio has confirmed that," Clement said. "How serious we are not sure yet. A hamstring is a minimum seven to 10 days." By contrast Everton manager Sam Allardyce is only looking up after an upturn in results since his appointment late last month. He has secured 10 points from the four matches he has been in charge with a further three coming in the match he watched from the stands the day before he was officially appointed. Allardyce has quickly sparked a response from key players Wayne Rooney and Gylfi Sigurdsson. Rooney took his tally to 10 in the league with Everton's third via a penalty after missing from the spot in first half added time only for Dominic Calvert-Lewin to convert the rebound to cancel out Leroy Fer's opener. Sigurdsson scored a brilliant second against his former club to put them ahead in the 64th minute as the unbeaten run continued. "Wayne Rooney has got 10 now and Dominic has got seven. We've got 11 in five, which is telling me we are also capable of scoring goals," said Allardyce. "So when people are thinking of us as a negative side because I talk about keeping clean sheets and getting the basics right we are not that negative." Allardyce is getting the best out of Â£45million summer signing Sigurdsson but he accepts that may be due to the fact the Iceland international is now up to speed. "He was always going to get better and better," he said. "I was speaking to Paul (Clement) before the game and he was saying it knackered them up and knackered Gylfi up because it (his transfer to Everton) took so long so when he arrived he wasn't match fit. "Now he has got to the level of match fitness we are seeing the best of Gylfi. He wants to go out and prove he is worth every penny we paid for him."